First Shift – Legacy, written by Hugh Howey is a rather fascinating read that had my curiosity burning the entire way through. 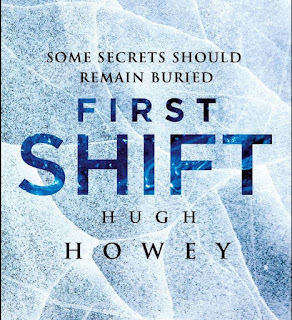 First Shift – Legacy is the prequel to Howey’s Wool series. If you have not read Wool, DO NOT READ THIS BOOK. The magic of the Wool series is not knowing certain things but rather, discovering things along your journey as you read it. First Shift – Legacy is the much needed prequel to the Wool series and knowing where the story is going is fascinating because Howey keeps the story feeling distant from anything you might know from Wool. You know where you’re headed but you just don’t see what route the road is going to take you! Throughout the book, you receive clues that are the puzzle pieces to the world of Wool. Clues that are hard to miss and yet Howey still manages to keep the story going off in a literary feint that sets you up for a great little twist. The story uses chapters to flip-flop between two time frames that are years apart. First the present, then the future. Or is it the present, then the past? Eh, in the end, it all comes together. If you read the Wool series, you NEED to follow it up with First Shift – Legacy. It is the 6th book in the series, but is the prequel you need once you finish Wool. It defines some of what was hinted at with Wool and explains the horror that is… well, I can’t spoil anything from either series. Suffice it to say that Hugh Howey wrote a book that is hard to talk about without spoiling and hence, I can only say that it’s been a long time coming that an indie-novel has caught my eye, my attention and my emotions. And Legacy is a pure joy to read as you learn one thing then another! For what that is worth! Also, keep your eyes peeled. I had a “conversation” with Hugh Howey, who was generous enough with his time a few years ago to take a few moments to entertain some questions that I had! I’ll be sharing with you here coming up pretty soon!